One of the great things about quilt camp at Camp Tecumseh is the fact that they always host a vendor who sets up a mini quilt store for the quilters to use in the lobby of the building. The quilt shops will have fabric, books, fabric, notions, and more fabric. It's fun to go shopping at 3 am. Or if you're in the middle of a project and you run out of something (or need additional fabric), it's nice to walk up a set of stairs and have lots of options to help complete your project. At the January camp more than two years ago, I came across a fat quarter bundle that I fell in love with. I bought the bundle and it sat in my sewing room, untouched, for about year. I finally found a project for the bundle and started putting it together. Because it was an "extra" project - as in it wasn't designated for anyone - I worked on this project in pieces, finally putting the top together in April. I wasn't sure what I was going to do with the quilt but when I received an invitation to my dad's, wife's, granddaughters high school graduation open house, I knew I wanted to finish the quilt for her. (I guess that makes her my step-niece?) I was able to layer and quilt this project in a weekend so that I could finish it in time for her party. 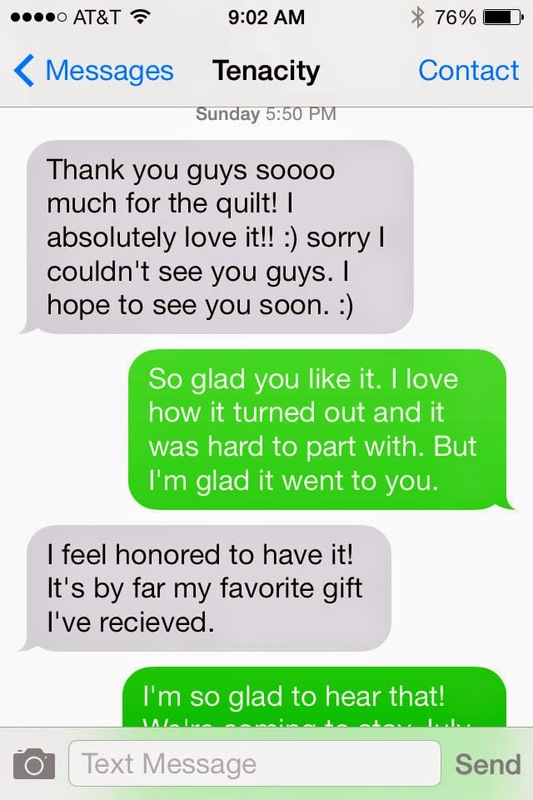 Tenacity is pretty cool kid and she totally deserves this beautiful quilt. Tenacity is headed to Indiana University-Purdue University Indianapolis this fall. She'll make a great Jaguar!